DEVIL IN THE DARK is a good little film. When it gets going it is a nice little thriller about two brothers who try to heal their estrangement by going off on a hunting trip only to find that there is something evil in the woods. Part family drama, part horror film DEVIL IN THE DARK takes a little bit to get going. The film starts off with a scary moment as the two brother’s father tries to find them when they were children. The sequence ends with one of the boys staring at something in the dark. It’s a creepy moment that is the last one for a while. While there are some nice moments the film doesn’t really gain traction again until the brothers get into the woods. It’s only then that the film really gets back into scary territory. I’m going to do something here that is not a supposed to be done by a film writer and let you know straight out that my feelings for the film were affected by the fact that I’ve seen six or seven (maybe more) similar films in the last couple of months. Distributors of all sizes seem to be releasing a whole spate of evil in the woods films and having sat through a good number of them they have started to blend together. While some have been good and some bad none have really stood out. I’ve reviewed some and I’ve ignored some- and I was going to pass on this film except for two things, one the performances of the two leads are very good and worth seeing, and most importantly the sting in the tail is perfect. Understated, real and on point. I got to the end and thought “yes that was worth it”. It’s a small moment, and I don’t want to over sell it but that small moment made the film worth it for me. 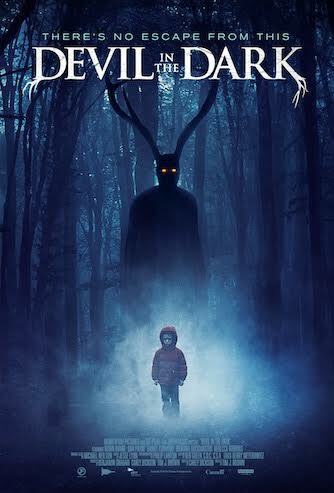 DEVIL IN THE DARK is out on VOD nationwide in the U.S. from Momentum Pictures on Tuesday, March 7th.